Another useful tool in the Exto portfolio is the Email Marketing Magento 2 extension. It allows to fully automate all your email campaigns increasing their efficiency and the revenue you get afterwards. 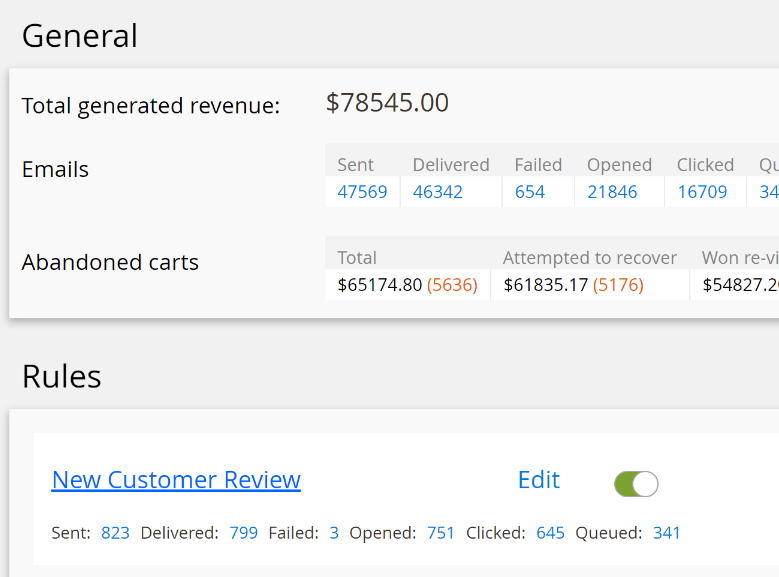 Follow up emails, abandoned cart recovery, data collection, and many other features are available with the module. The Exto.io Email Marketing Magento 2 module allows to create flexible rules for starting your email marketing campaign. Although the interface where you create a new follow up rule contains dozens of parameters, it is extremely easy to master rule creation due to prompts that appear in real time. You only have to read what each rule parameter is used for. Next, there is a dashboard with detailed data. The Exto.io Email Marketing Magento 2 extension allows to monitor what happens to your campaigns. There is a section that combines all rules as well as more detailed ones. With the help of the dashboard, it is possible to find out the total outcome from your email marketing, the amount of follow up-based revisits, as well as the qty of sent emails, etc. Exto offers several follow up triggers to choose from. 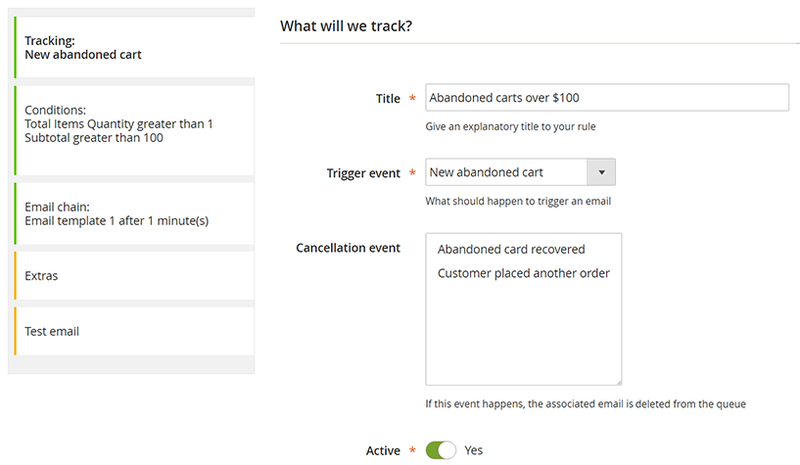 You can easily create a cart abandonment email, a behavior-based follow up, an automatically send message caused by a certain order status or a specific date. To make the email marketing campaign more precise, it is possible to select a customer group, a store view, and various product and cart conditions. Cancellation events can be specified as well. Perhaps, the most common usage for such extensions as the Exto.io Email Marketing Magento 2 module, is abandoned cart recovery. If a customer adds items t cart but don’t proceed to checkout, the system sends a message informing him or her about the abandoned cart. 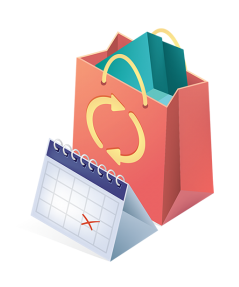 Alternatively, it is possible to motivate a customer to return to your website by providing discounts. Furthermore, you can ask a customer about the reason of the abandonment. This feature allows to gather information vital for improving the existing shopping experience. As for the amount of emails in a chain, the Exto.io Email Marketing Magento 2 extension has no limits. Of course, this doesn’t mean that you should send the endless amount of messages, but one email is not enough, so it’s a good idea to send 2-3 of them using different templates. The module allows to create custom interval for each email in a chain. 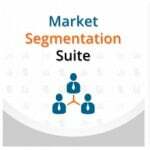 And due to variables, you can personalize each email even more, increasing its effectiveness. 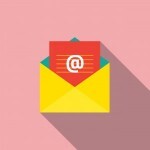 Note that all emails are gathered in a grid. You can check message history and queue here. It is also necessary to mention that Exto Analytics can be integrated with the Email Marketing Magento 2 extension in order to increase the precision of data the module collects.